All Thing's Digital D7 conference revealed more tech inside knowledge today, with the first taps on the touchscreen interface of Plastic Logic's long awaited e-newspaper reader. CEO Richard Archuleta presented the as yet unnamed and unpriced device in a Q&A session with veteran gadget hound Walt Mossbery, claiming the A4-sized reader will be aimed at a business market rather than the students and well-heeled book-lovers targeted by the Kindle DX. 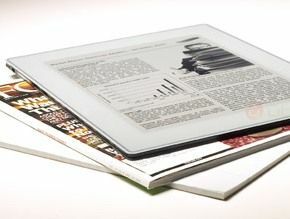 The Plastic Logic device, looking rather like a thin digital photo frame, was shown with a working e-ink screen and touchscreen interface. It uses tabs to switch between documents and a horizontal swipe motion to turn the page - reducing the possibility of accidentally flipped pages that have proven common with first generation Kindles. All you eager business users will be pleased to hear that the Plastic Logic reader will be able to display Adobe PDF files, as well standard Microsoft Office documents (Word, Excel and PowerPoint). There will also be an online e-commerce stores with books, magazines and newspapers for sale, accessed by either a 3G connection or Wi-Fi. Like the Kindle, the Plastic Logic device will be monochrome, at least at first. Archuleta also confirmed that the reader will not be available for purchase this year. This could be a real boost for Kindle, which could enjoy yet another Christmas without serious competition.